Welcome to Day #4 of Chocolate and Almond Theme Week. 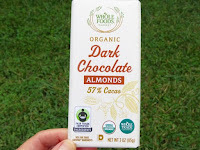 Today's Organic Dark Chocolate Almonds 57% Cacao bar was purchased at a local Whole Foods Market (based in Austin, TX*). 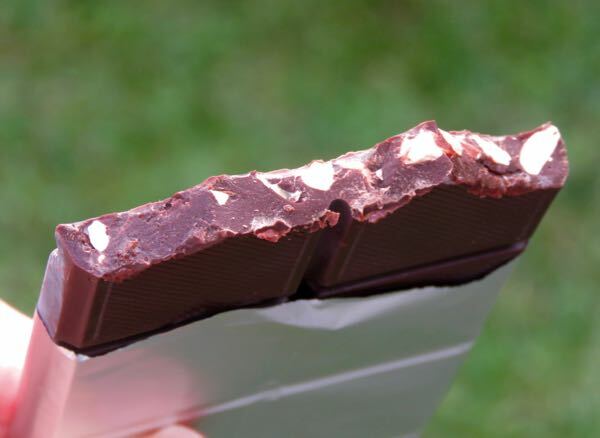 A smooth, but somewhat flat**, Forastero-like**, organic dark chocolate base surrounded pieces of organic, dry roasted almonds and a touch of organic ground vanilla bean(s). The bar was made with 90% Fair Trade Certified Ingredients and lacked emulsifiers and/or less desirable ingredients (thank you). *Whole Foods Market is now part of Amazon.com. ** Forastero is a popular, robust variety of cacao with bold, dense dark flavor. The largest source of Forastero cacao beans is West Africa; but it is also grown in most other cacao-producing countries (Ecuador, Brazil and elsewhere). The dark flavor is a bit like gazing into a dense, dark, still jungle, full but flattened somehow—the jungle being so thick that no light (or in this case fruit or other flavor notes) are either present or able to shine through.